University Hospital Southampton (UHS) NHS Foundation Trust provides services to some 1.3 million people living in Southampton and south Hampshire, plus specialist services such as neurosciences, cardiac services and children’s intensive care to more than 3 million people in central southern England and the Channel Islands. The Trust is also a major center for teaching and research in association with the University of Southampton and partners including the Medical Research Council and Wellcome Trust. UHS gained foundation trust status on October 1, 2011. The Trust was formerly known as Southampton University Hospitals NHS Trust (SUHT). 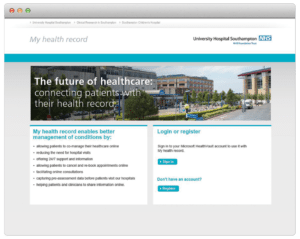 UHS NHS Foundation Trust identified a need to give patients access to manage their health through a health record. The aim of the project was to reduce the rate of hospital readmissions by encouraging patients to manage their health. UHS also wanted to improve communication between the provider and the patient. Get Real Health was engaged to provide a customized version of InstantPHR® in conjunction with Microsoft HealthVault, with specific pathways for gastroenterology and maternity. The pathways were designed to improve long-term condition management and follow-up management. 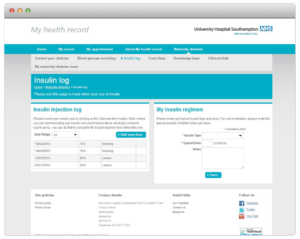 The toolkit provided valuable tools to help track patients’ overall progress and wellbeing within their pathway. By utilizing InstantPHR®, patients and their providers were able to engage in more productive sessions to evaluate their health and determine the right course of care. For an expanded rollout of the portal, Get Real Health provided UHS’ “My Health Record” with a website design refresh, a mobile patient portal activated and configured in the existing InstantPHR®, and an upgrade to InstantPHR® 3.2. Through a web and mobile web-based interface, InstantPHR® collaboratively enabled UHS to improve patient outcomes and enhance health. We also added the recommendations widget to bring additional personalized information to the patient, and made the health journals more user-friendly by allowing patients to store their previous entries and bring them up for easy reference when the patient makes future entries. By allowing patients and their providers to store and access health information, patients were able to take a more hands-on approach to their own healthcare. This ensured patients were seen only when they needed to be seen. All data entered by patients could be viewed and responded to by their providers, thus encouraging healthcare co-management. Improved communication allowed patients and providers to track health and interact without office visits or waiting for call backs. Phase II’s refresh and upgrade allowed UHS to better serve its demographic without sacrificing ease of use and, in many cases, improving usability. InstantPHR’s modular design meant a reduction in development time to initiate the project and provided patients with an easy way to monitor and manage their health. This project showed the flexibility of InstantPHR® and its capabilities and widgets, and assisted UHS in determining its future needs through real-time user feedback. 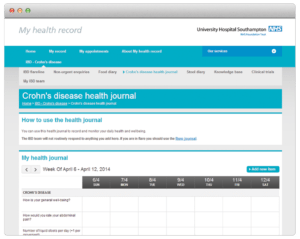 “Best Use of IT to Support Clinical Treatment and Care” at the EHI 2016 Awards for it’s InstantPHR-powered My medical record; “Using Technology to Improve Efficiency” at the 2016 Health Service Journal (HSJ) awards for it’s InstantPHR-powered My medical record; and “Best use of technology to share information with patients and carers” at the 2014 EHI Awards in the mental health category.